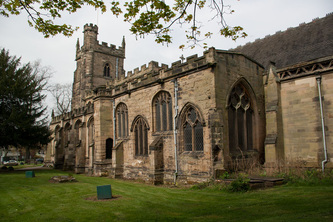 It is believed that a Saxon church was built on this site but no trace of this now remains. 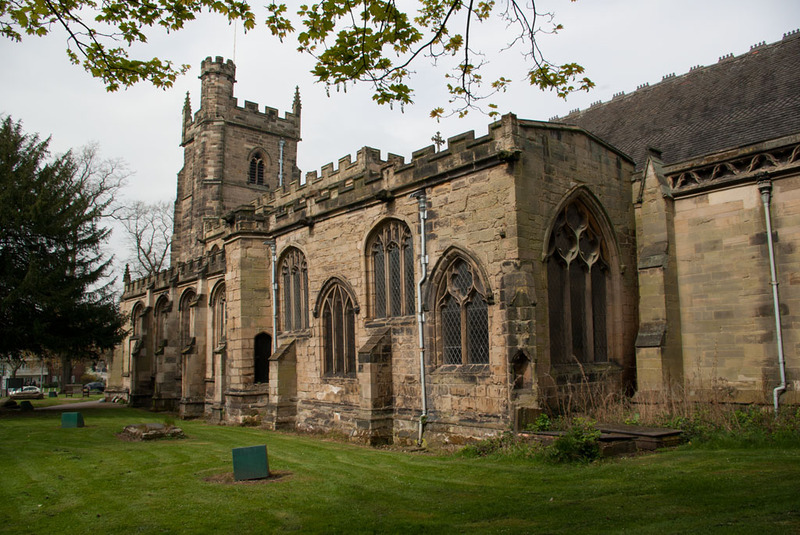 The oldest part of the current building is a portion of the south Wall which dates from 1350 when the Church was rebuilt in the reign of Edward III. This part of the church is known as the Leeke Chapel and was named after John Leeke, a merchant who reconstructed parts of it and endowed it as a chantry in 1507. 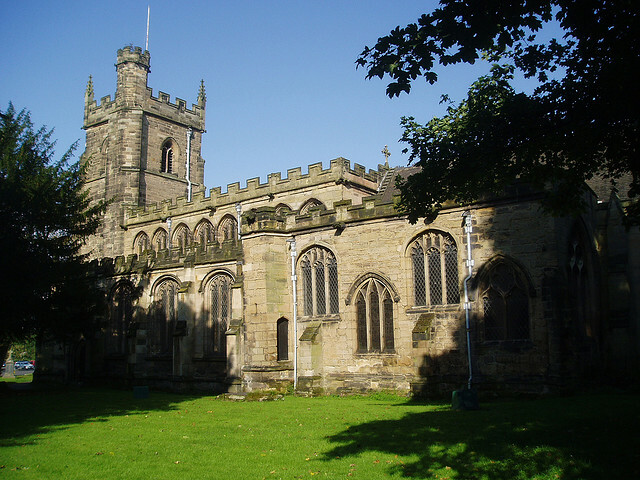 For about 40 years the chapel served as a school and in 1552 was granted a charter by King Edward VI, Then it be-came known as the grammar School. In 1596 the red brick building in the churchyard (now the Parish office) was built and the school transferred there it continued to serve as the Grammar school until 1879 when parts of the present college were built. 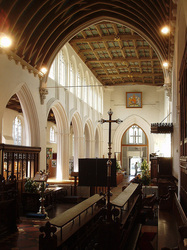 The nave roof was installed in 1500 and the clerestory windows were added at this is time. The line of the original roof is still visible on the wall at the West end of the nave. 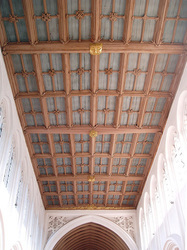 This portion of the roof was re-leaded in 1740 and again in 1988 when some of the original timbers had to he replaced. 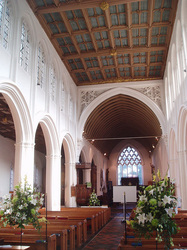 The pews were installed in 1853 when the church underwent drastic alterations. 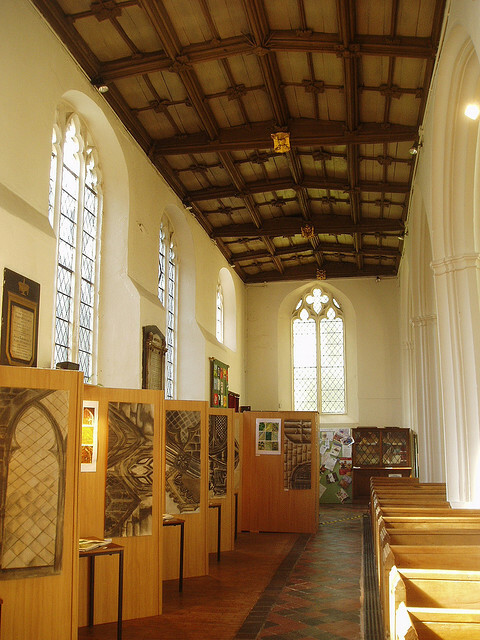 They were originally box pews complete with partitions and doors but were updated in the restoration of 1965. Also at this time the galleries were removed. The north Gallery had been installed in 1765 and the south gallery in 1790. 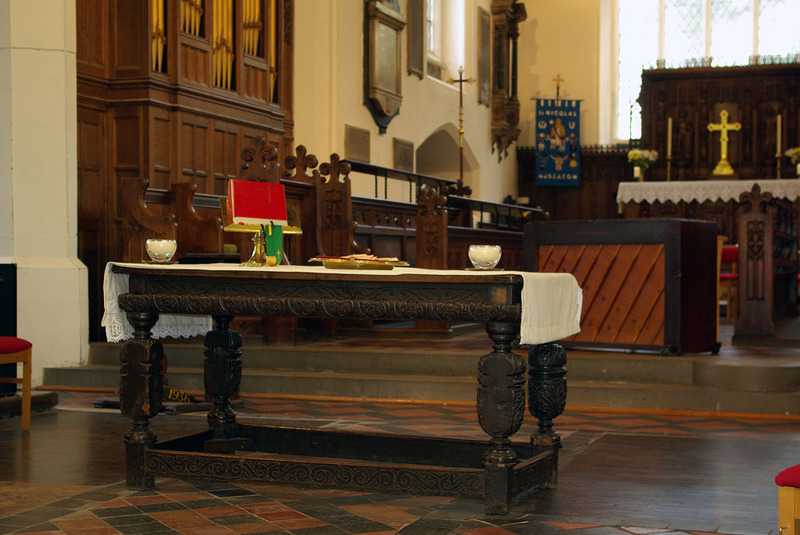 Until 1882 all pews in the church were rented with the exception of a Few free ones for the poor. The seats in the galleries were sold by auction. 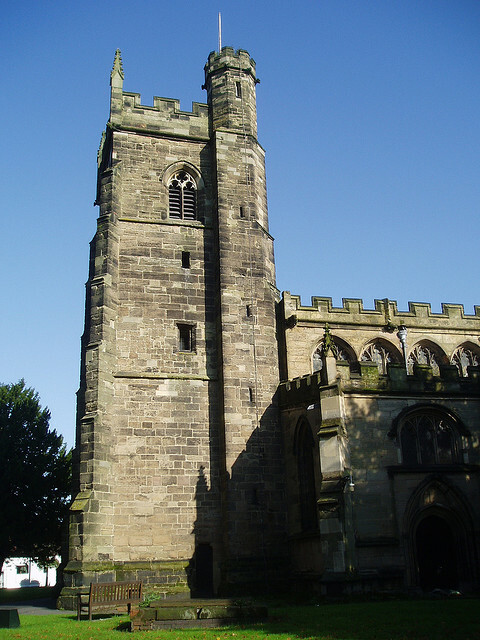 The first organ was installed under the tower in 1813 and to celebrate the event an organ recital was given for which an admission fee of one-shilling (five pence) was charged. The site of the old choir stalls is marked by the remains of the two sawn off ends of the gasoliers, once used for lighting They can be seen in The parquet floor in front of the glass doors. The chancel was extended eastwards in 1853 The 14th century east window was destroyed together with its stained glass. 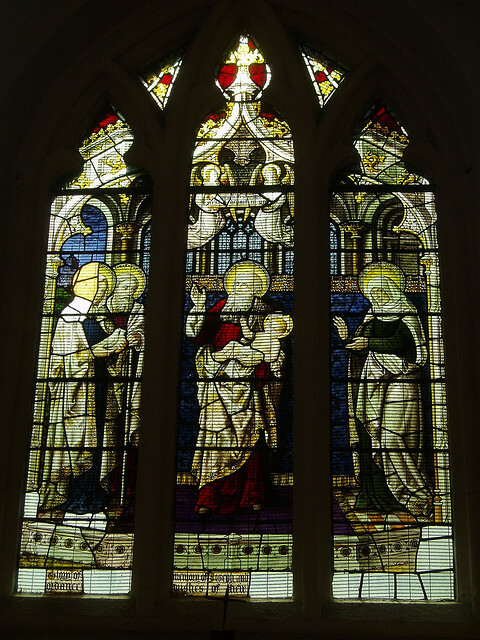 The Victorian stained glass which replaced it, together with the glass from seven other windows, was lost when the church was bombed in 1941. The one remaining stained glass window is in the Leeke Chapel and dates from 1923. The old East wall was where the brass chancel rail is today. 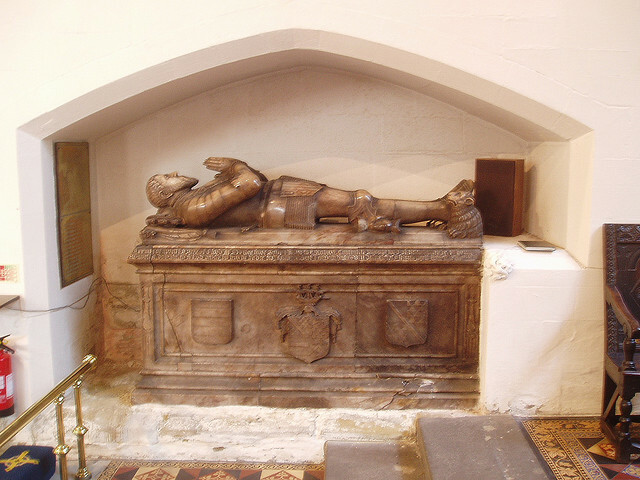 In the chancel is the alabaster tomb of Marmaduke Constable. 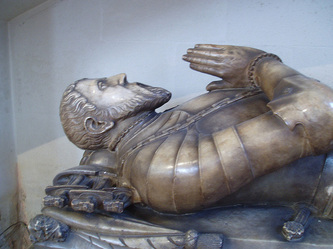 He was Lord of the Manor and died in 1560. The tomb was made in his lifetime. 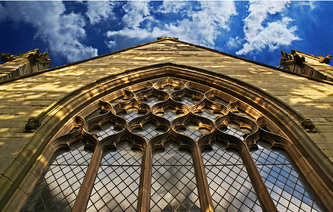 It is not the place of his burial so why it is in the church is a mystery. The tomb was once sited where the organ is now. All The monuments in the chancel have also been moved from their original siting. 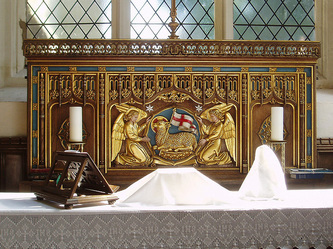 The reredos (wooden screen behind the altar), the altar and the choir stalls are all modem and installed in 1927 when the chancel was refurbished. The tiled floor was also laid at this rime. 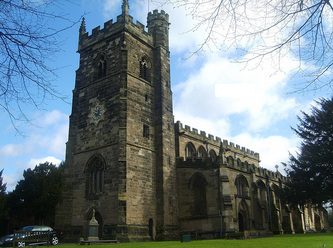 The chance steps are in memory of a former vicar. In 1853, when the chancel was extended, the original reredos, inscribed with the Ten Commandments, was destroyed. The chancel roof was installed in 1853 and represents an upturned boat - St Nicolas is the Patron Saint or sailors. The chance arch dates from 1853 and replaced a flat ceiling and a wall put in by the puritans. 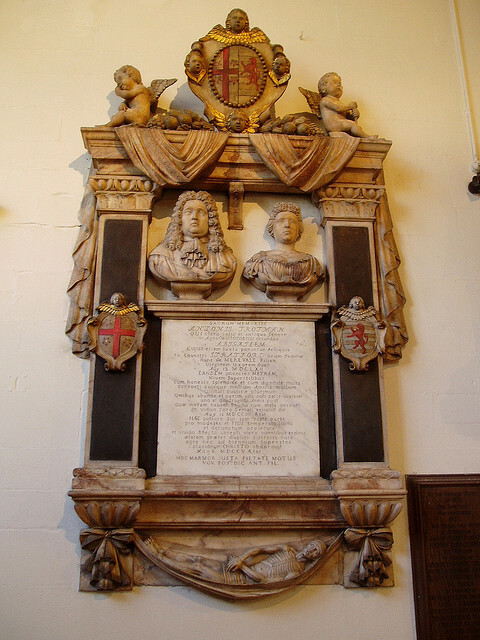 The wall was painted with the Royal Arms of Charles II at the time of the restoration in 1660. St Nicolas as is a royal patronage and as such is obliged to display the Royal arms. For 135 years no arms were displayed but a local artist painted and donated the current coat of arms in 1988. The vaults in the nave aisle are Victorian and when bought cost one guinea each. These are the only known sites of vaults in the church. The tower is 14th century and contains a bell chamber with a peel of eight bells. 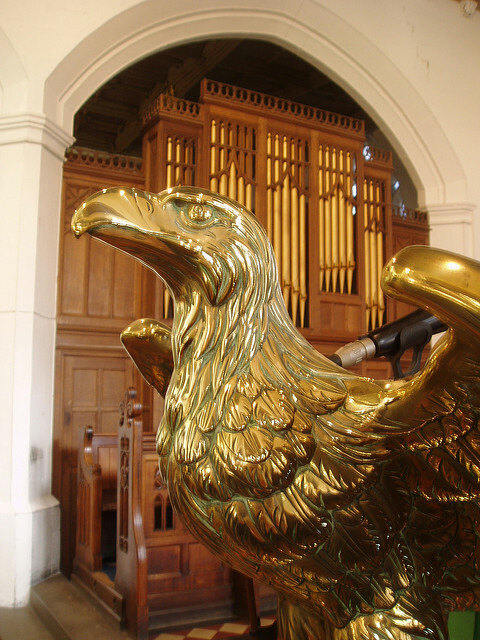 During the civil war the tenor belt signalled the nightly curfew imposed on the town. The bells were peeled to tell the towns people of the victory of Waterloo in 1815. When Queen Victoria died in 1901 the news was given by the tolling of a single bell. The bells remained silent throughout the period of World War II, as the ringing of church bells was the warning of Invasion. Naturally they rang out as a celebration of victory at the ending of the war. 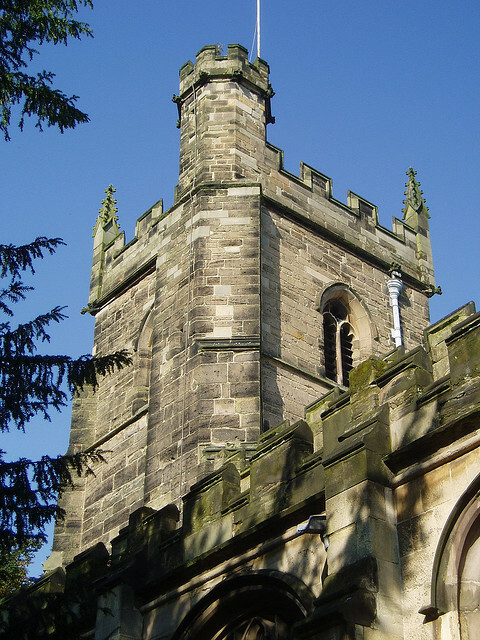 There has been a clock on the front of the tower since 1670 and the original clock mechanism is still its service having been restored in recent years. 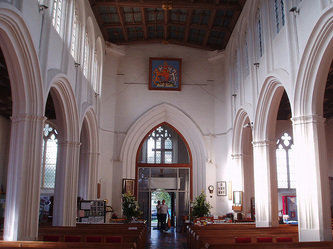 The Elizabethan vestry was extended in 1912 when the present door was cut into the north aisle. The font was originally sited in the nave aisle at the West end beneath the two devils carved on the ceiling. One devil is smiting, hoping to take the soul of the unbaptised child. 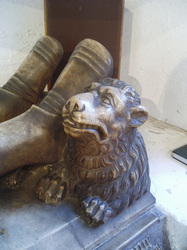 The other is scowling, showing his anger that the child has been baptised. 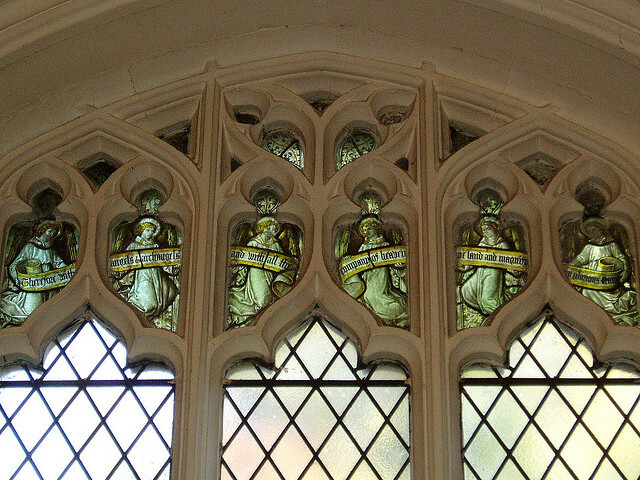 Above the chancel arch the five wounds of Christ may be Seen carved in the ceiling. 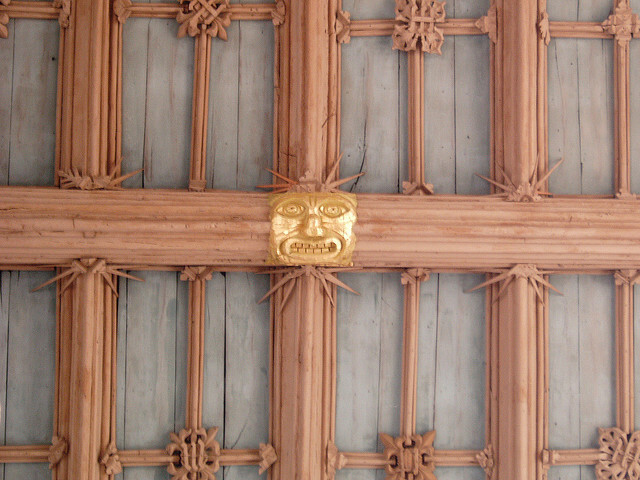 Until 1965 the ceiling was dark oak Colour but when the church was restored it was decided to lighten the ceiling and gild the roof bosses. The walls were lime washed for the first time in 1965. The list of charity benefactors and a wall painting. both on the north wall were lost at this time. 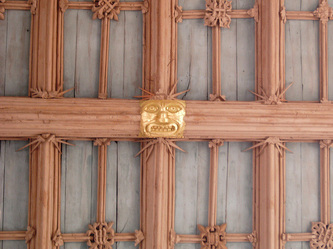 On the ceiling of the Leeke Chapel can be seen the face of the Virgin Mary and nearby on a beam is the devil putting out his tongue at her. 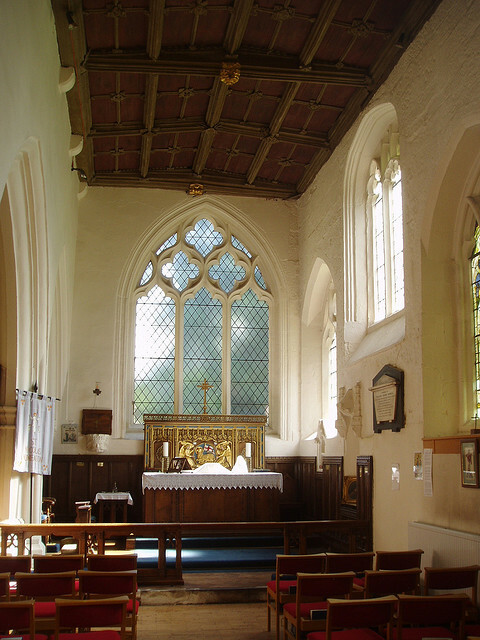 The Leeke Chapel is formerly a Lady Chapel dedicated to the Virgin Mary. After a variety of uses, including a period as a storeroom it was refurbished and dedicated for its present use in 1929. The head of King Edward II on the east wall of the chapel is now the site of the aumbrey. 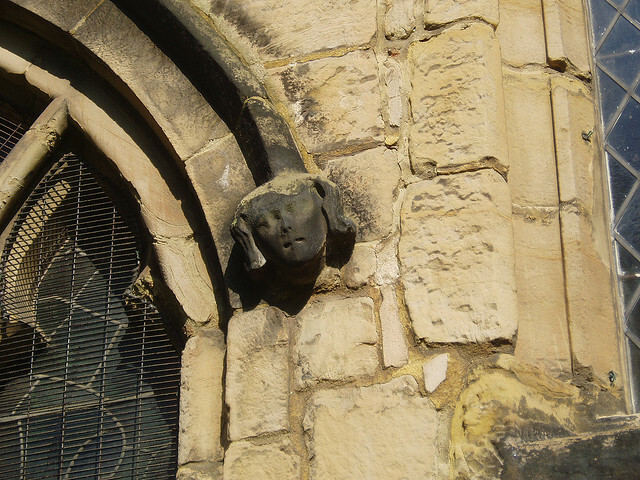 Many years ago there was a hole in the wall above the Kings head which was used to feed lepers who were not allowed into the church. On the external South wall of the chapel are the remains of ancient Mass Dials. They were a form of sundial and were used to indicate the times of services before clocks were common. On the same wall can be seen vertical grooves cut into the window ledges, these were made by archers' sharpening their arrows. The turret, also on, this wall, once led into the chapel but was blocked off by the puritans. It now leads only to the roof. The churchyard has been closed since 1873. 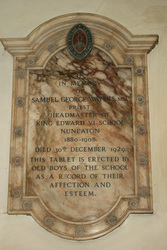 The last burial was in 1929- the oldest tombstone in The churchyard is dated 1670. 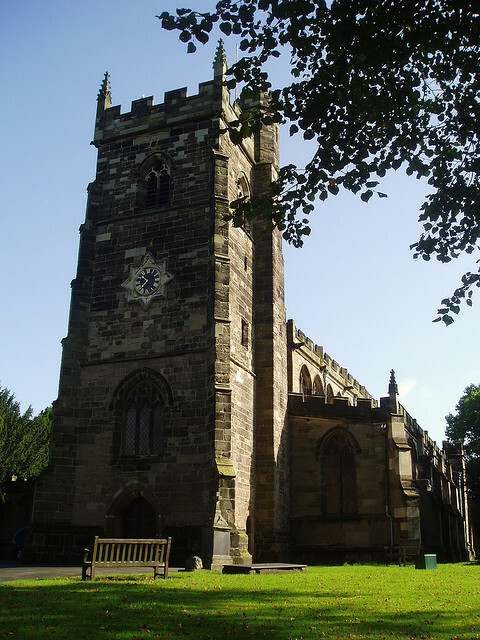 A former Vicar is buried with his family and with the body of a young African Chief who died whilst staying at the vicarage. The lime trees at the front of the churchyard were planted in 1836 at the expense of a Churchwarden. George Eliot knew the church. 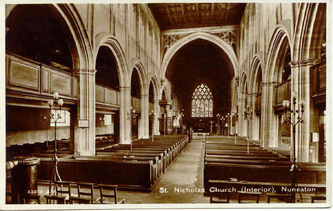 In her book "Scenes Of Clerical Life" she depicts St Nicolas as 'Milby Church'. She attended the Elms Boarding School, which stood next to the Parish Hall and was demolished after it was bombed in the last war.